IP-adresse eller brugernavn Enter the username, IP address, or IP range to block in the "User" field. If blocking an account, make sure to check the spelling since nonexistent users can be blocked as well. Instead of typing this information in manually, it is also possible to click on a "block" link in recent changes, contributions pages, or history pages, which will automatically fill in this field with the appropriate username or IP address. A "Block this user" link is also present in the toolbox when viewing User and User talk pages. Handlinger, som skal blokeres: Allows a block to be configured to prohibit specific actions, therefore allowing all others. Redigering If checked, the target of the block will be prohibited from making changes to wiki pages, including editing, renaming, reviewing pending changes, and other change actions. Delvist Prohibits the block target from making changes only to the specified pages and/or all pages in namespaces. All other pages can still be edited, new pages can be created, and files can be uploaded. Up to 10 pages can be added to the block, non-existent ("redlink") pages cannot be blocked. The corresponding talk and subpages are not automatically blocked and must be entered separately. Kontooprettelse: Selecting this option will prevent the blocked username or IP address from creating new accounts. Sende e-mail: When this option is selected, the user will be unable to use the Special:EmailUser interface. If an IP address or range is blocked with this option, and it is not set for anonymous users only, accounts logged in from that IP address or range are unable to use Special:EmailUser. Redigering af egen brugerdiskussion: This option is only available if $wgBlockAllowsUTEdit is set to true; it is not by default in MediaWiki 1.25 or lower. In 1.26 or later it is set to true. 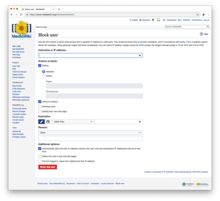 For a sitewide block, selecting this option prevents the IP address, range, or user from editing their own user talk page. This option is usually ignored for partial blocks; to prevent a partially blocked user from editing their own talk page, the talk page must be specified as a page to block. The only exception to this is where a partial block prohibits the target from editing the "User talk" namespace; in this situation, this option behaves as it would for a sitewide block. varighed Select when the block should expire from the drop-down, or manually type in an expiration time of the block or use the Datetime calendar to select. When manually typing in a time, follow the GNU standard format (eg: 2017-01-01 00:00). The default options in the drop-down may be modified at MediaWiki:Ipboptions. Begrundelse: The reason selected from the drop-down combined with the other/additional reason specified will be used as the message displayed to the blocked user when they try to edit. The default reasons in the drop-down may be modified at MediaWiki:Ipbreason-dropdown. Spær den seneste IP-adresse der er brugt af denne bruger, samt automatisk alle følgende IP-adresser brugeren forsøger at redigere fra: This option is only available when blocking a username. But this is available for both partial and sitewide blocks. When selected, the user's IP will become "autoblocked" (these show up as numbers such as #17 on the active block list) for a short period of time and any other IP addresses that the blocked user tries to edit from will be blocked as well. The duration of an "autoblock" can be changed by adjusting the value of $wgAutoblockExpiry . Skjul brugernavnet i redigeringer og lister: When selected, the blocked username or IP address will not be added to the block log, the active block list, or the user list. Other users with the ability to view these hidden entries will still be able to see and unblock the username or IP address. This option is not enabled in a default installation of MediaWiki; the person putting the block in place must have the hideuser permission. See Manual:User rights . Overvåg denne brugers brugerside og diskussionsside. : When selected, this adds the blocked user's user page and user talk page to your watchlist. Forhindr indloggede brugere i at redigere fra denne IP-adresse: This option is only available when blocking an IP address. When selected, registered users who try to edit using a blocked IP address will still be able to edit. Otherwise, they will be unable to edit as well. Double-check everything you entered and click on Bloker denne bruger. A message should appear saying if the block was successful or unsuccessful. To unblock a username or IP address, go to the active block list and click on the Ophæv blokeringen link next to the user or IP you wish to unblock. Then, enter in an optional reason and click on the unblock button. A message should appear saying if the unblock was successful or unsuccessful.